More than any of their previous books, this one has the most to say about what Rolland and Heidi have learned about love - whether in Africa or wherever home might be: finding intimacy with Jesus, concentrating on the humble and lowly, being willing to suffer for love's sake, finding God's supply of utterly needed miracles, and walking in the unquenchable joy of the Lord. Every reader will find incredible challenge and refreshment in these pages. Continuing where their previous book, The Hungry Always Get Fed, left off, this narrative encompasses five years in the life of IRIS Ministries - a rollercoaster of highs and lows, amazing miracles and overwhelming need. Woven into the story is teaching from Heidi Baker that communicates the distilled wisdom of all the Bakers have learned about the heart of the gospel in 30 years of mission and church planting. More than any of their previous books, this book communicates the heart of what Rolland and Heidi have learned from the Holy Spirit and then applied. They share their core values - simple, controversial and non-optional - tested and adopted over time, which must apply to any missions context if it is to be successful. Read and be inspired. About the authors: ROLLAND & HEIDI BAKER are the founders and directors of IRIS Ministries and have been missionaries for 30 years. They have taken deliberate steps to associate themselves with the world's poorest people and have become known for "stopping for the one." After spending many years ministering exclusively in Mozambique, Rolland and Heidi now travel internationally, teaching others about the simplicity of "passion and compassion" in the ministry of the Gospel. 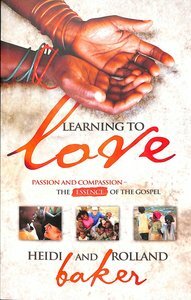 Customer Reviews For "Learning to Love"
This inspiring book follows on from the Baker's account of Iris Ministries in Compelled By Love and is every bit as encouraging and helpful to those wanting to be stretched and challenged in their Christian walk. Many testimonies are shared, all glorifying God with Jesus Christ at the centre. I was very encouraged by Rolland's input in this book as it reflects the awesome work God has done in his life.